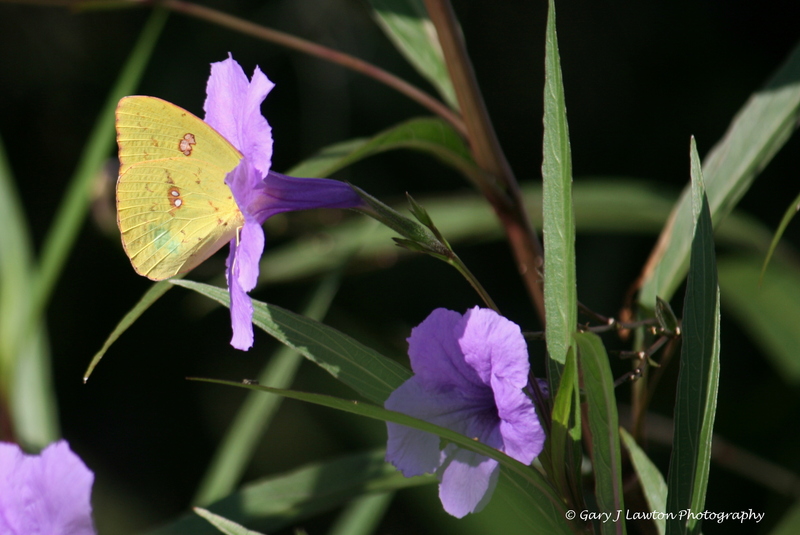 Cloudless Sulphur butterfly reaches deep inside the petunia flower to sip the blossom’s nectar. Anne closes the front door as we leave our villa to begin our morning walk. I see a medium-sized butter-yellow butterfly fluttering around the red hibiscus shrubs that stand as sentries on each side of our garage. These plants prop up about a dozen red flowers each day. Although cloudless sulphur butterflies inspect these crimson adornments, I have yet to see this butterfly sip nectar from the hibiscus blooms. We walk, past other homes, on a concrete sidewalk paralleling a black paved road that leads to Lake Tsala Apopka. The street curves to the east and we enjoy seeing the rising sun and smelling the fresh air cleansed by early morning rains. A sulphur butterfly joins us for a moment pops over our heads and continues in the same direction, but takes a straighter course towards the lake. I assume it is searching for sweet nectaries to eat breakfast. It is amazing how quickly this butterfly travels. Its speed is faster than I can run, trust me. It continues out of our view. We walk past the community clubhouse where we pause to enjoy the garden of plantings. Several cloudless sulphurs flutter from one flower to another. The sulphurs favor one shrub in particular – the purple showers shrubs, supposedly a sterile subspecies of the highly invasive Mexican petunia. The plant has long blue-violet tubular flowers. It is a perfect fit for these butterflies since they have an extremely long proboscis, a straw like tube that it uncoils to reach the nectar deep inside the blossom. I focus on one individual as it momentarily lands on one blossom, then alights and rises up beating its wings a couple of times and floats down to a different flower. I wonder if it is the sulphur butterfly that briefly joined us for the walk. Did it know this was the McDonalds of the area? Or was it happenstance that it found it. After walking along the lake, Anne and I head back to our home and see more sulphurs flying in the neighborhood. “Head east to the clubhouse,” I tell them. There is lots of food there! ← How Did the Butterfly Get Its Name? What a beautiful picture you paint with your words, as well as your camera! Thank you. I sent the link to my family…you make living in Arbor Lakes very attractive to nature lovers.